Vixen manufactures their fine-quality Lanthanum Eyepiece series in two variations, the 'standard' and the Lanthanum Wide variants. Both lineups have multicoatings upon every air-to-glass surface within the eyepiece, and do so at a comparative value versus other premium units in the marketplace. But with 65° of apparent viewing field across the entire Lanthanum Wide collection, you'll really feel surrounded by the viewing experience. These are large, premium eyepieces that truly deliver. You can't imagine the pure joy and unadultered viewing experience that is gazing through a 2.00" eyepiece until you've experienced it for yourself. It doesn't matter how finely coated and optically brilliant a combination of mirror/prism/diagonal & 1.25" eyepiece may be-if the telescope in use has a 2.00" focuser and you were to replace the components with similar-quality 2.00" versions, the viewing will be better by a seemingly exponential factor! 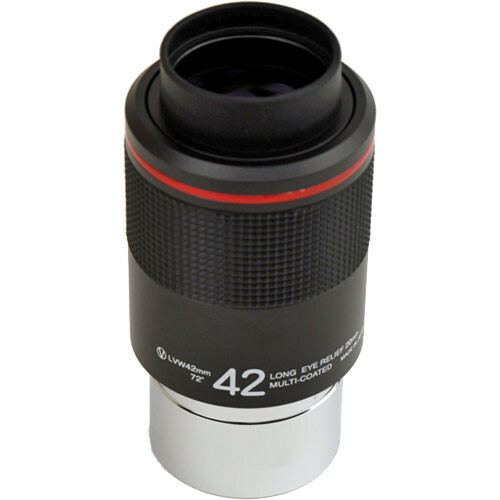 All 2.00" eyepieces are large affairs, some suitable for anchoring a dingy. They are not suited to wimpy telescope mounts, but if you've got the support you've got to try it for the wonderment of the view.